The more I continue to work in retail the more it seems stores have to work harder to prevent shoplifting and theft. I have seen all kinds of things stolen and sometimes I still can’t believe the missing items I find while working on the salesfloor. I have found empty pen refill packages and one Sharpie marker out of a package of 5 missing from a package. I have even found an empty package for store brand tape! C’mon if you’re going to have sticky fingers do you really need store brand tape? Yes, there are all sorts of odd things that can go missing and working the salesfloor I find a lot of empty packages for these products. There are also items that are stolen and I never would have thought about them as high theft items until I found out how frequently crooks will try to return them for a cash refund. In the store where I work one such category of merchandise is label maker tape. Good grief some of these can be nearly $25 for a single tape package and a double tape pack can be almost $40. From my perspective as someone who was in Loss Prevention for about 14 years I look at these tapes and see how small the packages are. They can easily be picked up and placed in a pocket and you would never know it. Items such as the label maker tapes are a popular because they present a small risk of being caught for a high reward. If you think about it placing a double pack in two jacket pockets and walking out of a store is a pretty easy $80 haul. 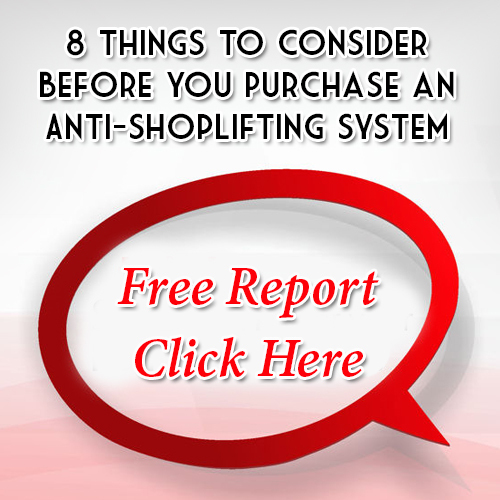 A good shoplifter can get in and out of a store in less than five minutes with your merchandise. Sensormatic Safers are a solution to this problem and they work with a Sensormatic pedestals. Ah, I know you think you have me now. You have already addressed this possibility in your store policies. YOU don’t allow your store to take back no-receipt merchandise. Let me clue you in on something, your policy is not going to prevent shoplifting I can guarantee that. I have dealt with professional shoplifters and they are a step ahead of you. Since you won’t take back the stolen products then they are more than willing to take it to another business that sells the same product and will give a no-receipt cash refund or merchandise card. If it is a merchandise card they will sell that on the street. An $80 merchandise card can still pull in $20 – $40 in cash. Now you have me in a corner, you are the only store selling the tapes in your area so there is nowhere else to take them. Nice try, please let me refer you to the internet and online market places such as eBay. If that doesn’t convince you there is probably a flea market or mom and pop shop in your area you might want to visit. On the bright side Sensormatic Safers are an affordable and effective method to stymie shoplifters who look for small pieces of merchandise to steal. Flexible Safers are sturdy, locking pouches that incorporate electronic article surveillance that makes it much easier for retailers to prevent shoplifting of those pocketable prizes. The best theft scenario for a shoplifter is to walk into a store with no merchandise protection, no Loss Prevention measures in place and poor customer service. This is the perfect hunting ground for a crooked customer. The addition of an anti-theft system and tags and labels is the first step in deterring criminal activity and reducing theft related shortage. Remember, I started this article talking about theft that surprised me and has caught me off-guard to some extent. Not everything has to be protected no matter how silly it is to steal such as pen refills. For those items that SHOULD be protected such as label maker tape, ink jet printer cartridges and even batteries Sensormatic Safers are the perfect solution for your store. Pocketable products may be costing you more than pocket change, Sensormatic has the right solution for all the items you sell. For more information on Sensormatic Safers contact us or call 1.866.914.2567 today. For more information on Sensormatic Safers, contact us or call 1.866.914.2567 today.